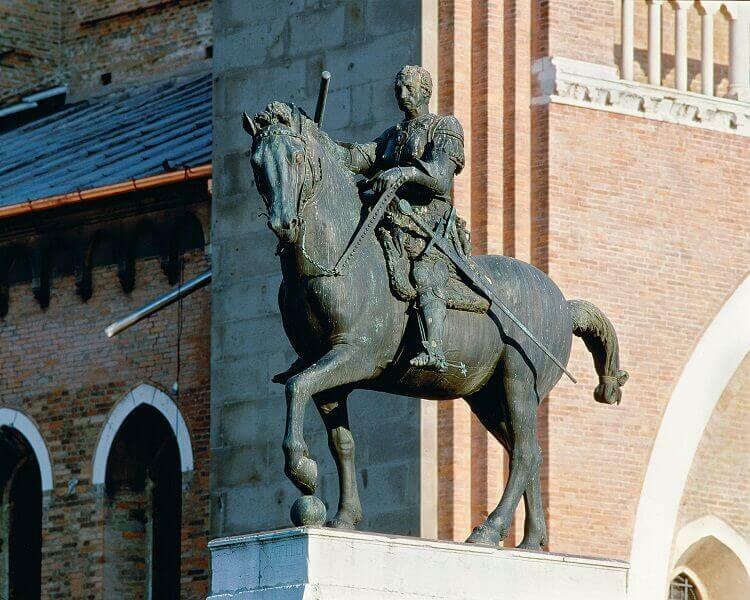 Donatello's Equestrian Statue of Gattamelata was created during the period of time he spent working in Padua. It was completed in 1453 and is unique among his works for still remaining in the location where it was first installed. The piece was commissioned by the Republic of Venice to memorialize Erasmo da Narni. The military leader was nicknamed "Gattamelata." He rose in ranks to become the General Commander of all the armies in the Republic of Venice. Donatello's depiction of Gattamelata was the earliest equestrian work of its kind created during the Renaissance. The statue is cast in bronze and portrays Gattamelata and his horse as life sized. Donatello did not make the military leader larger in order to emphasize his importance. Instead he positioned Gattamelata upon his horse with a facial expression that reads as unshakably confident. His horse is in mid-stride and his large sword is sheathed at his side. Donatello chose to depict Gattamelata at the height of his career. Donatello employed symbolism to portray Gattamelata's military prowess. His horse appears powerful and places his front left hoof upon an orb that symbolizes the earth. With the orb's inclusion Donatello elevates Gattamela's social rank. The musculature and posture of the horse is reminiscent of Roman classical antiquity while its execution is distinctly naturalistic. The large statue sits atop a pedestal crafted to symbolize the entrance to the underworld. Reliefs underneath the doors display putti, Gattamelata's coat of arms, and angelic figures in battle armor.